Broadcast News: Massive TV Job Cuts; Weather Unaffected? The current economic climate has had a strong negative effect on advertising. This is sending a chill wind through the broadcast industry, but recent cuts seem to have left weather reporting relatively unaffected. The dcrtv blog reported yesterday that massive job cuts were announced in the news department of Washington's local ABC affiliate, WJLA, Channel 7, and its sister operation, cable News Channel 8. The 26 cuts, mainly in the back office, include several on-air personalities, but no meteorologists have been listed. Allbritton Communications, which owns the Washington stations, also is reported to have made cuts at its stations in Little Rock (KATV), Birmingham (WBMA), Harrisburg (WHTM), Charleston (WCIV), and Tulsa (KTUL). A TV photography forum post from Birmingham indicates that 2 positions in weather were cut. Albritton's bond rating was cut by Standard & Poor's back in October to "B", considered "Highly Speculative." 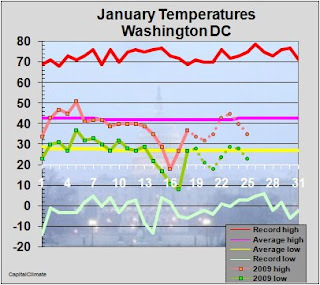 2013 Update: See Inauguration Weather 2013 Update for more recent data. Jan. 23 Update: Added January daily chart and link to hourly observations for Jan. 20. Sky: Few clouds at 4500 ft, Overcast at 25000 ft. Complete hourly weather observations from the National Weather Service are here. The occasional snow has now moved out of the Washington area, which received only a minimal accumulation. Total precipitation at the major reporting locations was 0.01" at Dulles and BWI, with only a trace at National Airport. Baltimore Inner Harbor reported a whopping 0.03". Snowfall amounts were a bit higher to the north and west, with some reports of 1-2" in central and northern Maryland. The outlook for Inauguration Day continues to be cold and dry, with a brisk northwesterly breeze. A few snow flurries are possible (20% chance) in the afternoon. After a morning low in the lower 20s, temperatures will struggle to reach the freezing mark later in the day. Noon update: BWI with 0.01" is the only one of the three major airports in the region to report measurable precipitation so far. Twenty-four hours before the Presidential Inauguration, intermittent light snow, punctuated with breaks of sunshine, has developed over portions of the Washington metro area. While nowhere near the magnitude of the Taft Inauguration storm of 100 years ago, the expected snowfall of up to an inch could lend a wintry appearance to pre-Inaugural activities. Temperatures will reach the mid 30s this afternoon, but will fall tonight to the mid 20s on northwesterly winds. On Inauguration Day, winds gusting up to 25 mph will make the temperatures in the high 20s to near 30° feel even colder. Temperatures have moderated significantly overnight, rising above freezing for the first time since Wednesday, when the high was 35°. 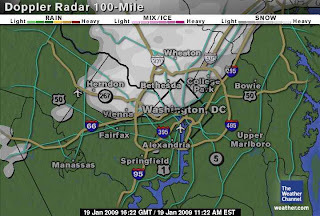 Radar is showing light snow and mixed frozen precipitation over much of the Washington metro area, but surface reports indicate that little, if any, is reaching the ground. The computer models have continued to disagree through this morning's runs, but the main storm development in the next couple of days is likely to be south and east of Washington. Some occasional light snow and/or sleet is still probable through Monday, with colder, but not extreme, temperatures returning by Inauguration Day.